The latest update for Invisible, Inc adds two new spies, Nika and Dr. Xu, who fit nicely into crowd control and support roles respectively. Still, if you don’t like them you could always send them to the surgeon’s table and make a couple of alterations. The update has added agent augmentation to Klei’s XCOM-alike. 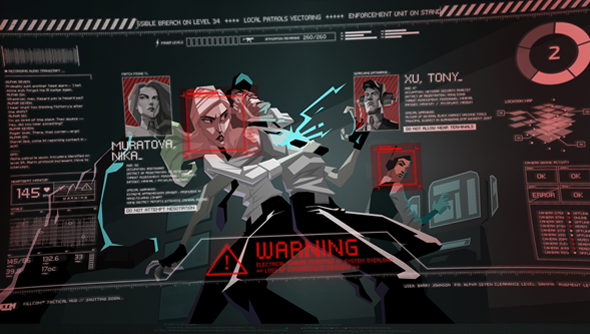 Like some sort of pacifist’s XCOM, Invisible, Inc puts you in command of a team of specialists, only you’re not fighting off alien invaders, you’re sneaking into corporation headquarters and robbing them blind. This latest update makes a fair few changes and additions to the Early Access game. Firstly, there’s the two new agents. Nika, is the agent you want on your team for when everything goes wrong. She can wield two handed weapons – shotguns, rifles, anything that better take on a group of security. Dr Xu on the other hand is able to infiltrate computers remotely, even through walls. It’s easy to see while he could be a great person to have on the team, if you can hack a databank through the wall then you can dodge a lot of security cameras and guards. The new cybernetics lab lets you submit your agents to mechanical augmentation, giving them abilities like heat vision, armour plating, and 360 degree line of sight. There’s also a new throwable item. a slew of new animations, HUD changes, and balance tweaks. The full patch notes can be found on the next page. * Monst3r will buy items in the agency’s stash as well as sometimes have trinkets to sell. * A new throw-able item. * Add speech animation to guard HUD displays. * Added manual camera control option to Gameplay options. This prevents *all* automatic camera panning. * Accelerator Chip bonuses now stack with the hacking bonus. * Removing Valuable Tech from a scanner will disable it permanently. * Stealth, Hacking and Anarchy skills have been reevaluated, also given a fifth upgrade level. * Parasite loses cool down and gains increasing cost with active parasites. * The artifact heavy vault has been adjusted. * The Executive is planning a big night out and has more cash on hand. * Programs are now only found at Server Farm Terminals but there are more programs available at each terminal. EDIT * Agents do not get extra equipment after being rescued, but start with their unique augment. EDIT * Prisoner has 8 AP. * Window resizing is aspect ratio constrained on Windows. * Unlockable images are correctly blacked out when viewing the Score screen. * Fixed certain tiles being incorrectly identified as seen or unseen for LOS calculations. * Fixed game data hash validation for OSX. * Fix possible crash when using data blast on a non-existent location. * Fix some mission dialogues being incorrectly reshown when loading a save game. * Fix most (all?) instances of guard instant-shooting after overwatch on the same turn. * Fixed inputting of symbol characters on OSX. * Fix possible crash when checking PC distance from interrogated guards. * When reloading from a save game with an error, the level will load from the last successful action rather than the beginning. * Fix possible crash when using Shade. * Fix misaligned text cursor when editing an empty edit box. * Knocked-out prisoners are draggable. * Usability improvements when using the accelerator chip. * Game Over will only occur when all units are dead and/or pinned, instead of simply KO’d. * The Captain is no longer always KO’d for 6 turns. * Fixed a bug where special guards could lose their impass status. * Fixed agents sometimes going invisible when using overwatch. * Fixed doubling-effect when employing both Parasite I and II at the same time. * Turrets now count as cover against guards. * Fix akuma drone missing animation when EMP’d. * The mole will work correctly. * Agents without the new agent augments will have them automatically installed. * Melee piercing calculation from augments is fixed. * Crash fixed while escaping with an agent dragging a body. * Fix a crash that can happen with Abort Game. * Fix a crash that can happen while paging through the agent status dialog. * Fix a crash that can happen when a drone comes near an augment machine. * Fix an assertion that can happen when you kill the Executive. * Fix a potential crash when a unit is being KO’d. * Fixed Null drones so they have no weapon.